Wellon e-cig expert told Olivia that there were many names relate vapour pen. Vape pens, also referred to as vaporizer pens, vapor pens or Vape pen mods are tiny pen-shaped vaporizers. Most of the time, above names are saying one thing, the vapour pen is. Is vapour pen very unique? The shape of vapour pen is similar with normal cigarettes. But this not equal that vapour pen is cigarettes, they are very difference two things. Originally vape pens were made to look like cigarettes but since then have evolved into their own thing. Vaporizer pens are typically powered by a small battery that screws onto a tank or atomizer that contains a heating coil system. 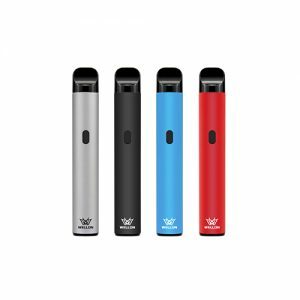 The vaporizer pen is then loaded up with nicotine-containing liquid and when the button is pressed, the battery engages the coil and vapor happens. So, from the working theory of vapour pen, it’s very differ with normal cigarette, and very unique. If you have research on the vapour pen area, you will find that there were many branches of vapour pen. So, this part we are going to discuss the construction of most normal vapour pens. Usually, vapour pen contains six parts, Battery, Coil, Wick, Atomizer, Power button and mouthpiece. Vapour Pen Battery – The battery provides power to the coils of the atomizer, which is what allows it to heat up and vaporize e-liquid, wax or dry herb. This is the power supply for your vape pen. Vapour Pen Coil – This is a piece of wire that has been wrapped around a small cylinder to create a coil that vaporizes e-liquid or wax. They usually contain some kind of wicking material. Vapour Pen Wick – This is the material found in a coil that absorbs e-liquid and wax thus optimizing vaporization. For e-liquid, this material is usually silica or cotton and for wax, quartz and ceramic it is quite common. Vapour Pen Atomizer – The atomizer is the part of a vape pen that contains some kind of coil that will heat up when the power button is engaged. Vapour Pen Power Button – The power button, also called the fire button, is used to engage the atomizer. It is typically also used to turn the battery on and off by pressing it five times. Some batteries also allow the user to adjust their voltage by pressing the Power button three times. Vapour Pen Mouthpiece – This is the part of the vape pen that you put your mouth on and inhale from. You might hear someone refer to this as the drip tip, even if you are not dripping your liquid into it.